Excel Roofing are a small family run business that have been in operation for over 20 years. 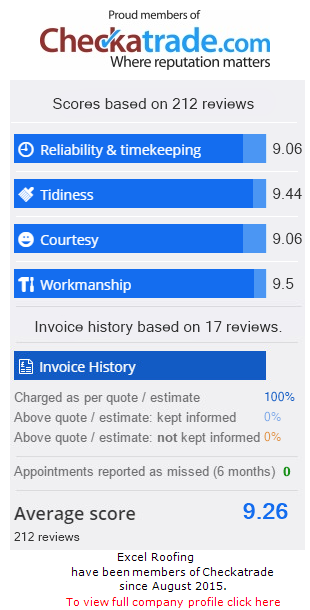 We believe we offer a unique service which is friendly yet professional. Most of our work comes from repeat customers or referrals, hence we have no need for big advertising campaigns, hence no massive overheads, all this means we can often beat any quote. We are a friendly and professional roofing company, based in Luton and offer a quality, value for money service. We serve all of Bedfordshire, Hertfordshire and Buckinghamshire. We work Monday to Saturday 8am till 6pm, and also offer a 24 hour emergency call out service. If you are looking for a roofer in Luton, then please give us a call. We will send a professional roofer round to give you free help and advice. And if needed a free professional quotation sent via email or post.